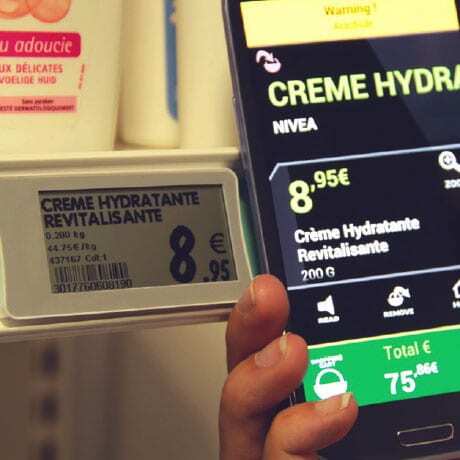 French supermarket chain E Leclerc is set to roll out NFC electronic shelf labels to six hypermarkets this year, following a successful introduction of the technology at a store in the Paris suburbs in late 2012. In December last year 47,000 NFC-enabled electronic shelf labels developed by Store Electronic Systems (SES) were placed on the edges of shelves across the chain’s Levallois-Perret store. Each label is fitted with a 127dpi dynamic display as well as a high-speed radio transmitter and an NFC tag. When a shopper taps a label with their NFC phone they can access detailed information about a product, including warnings about possible allergies, and gain access to personalised offers and coupons. A customer can also build up a shopping basket to track the cost of their shop in real-time. All the customer has to do is download the retailer’s mobile app onto their smartphone before going on to tap the labels. Payment using the app is also an option, although NFC payment is not in place at the Levallois store today. “We capitalize on the large adoption by end users of NFC smartphones,” SES has told NFC World. “Using them as a reader (self-scanning via a smartphone) they give to brick-and-mortar stores the ability to connect personally and seamlessly with end users within the stores. It combines both advantages of the physical and digital channels. “We don’t provide retailers with their apps, retailers develop the apps for themselves. What we provide is the software that is fully integrated with the retailer’s back office. “Our software identifies a price change in the back office. We send information via radio to the electronic shelf labels to update the content. The label is fully synchronized to the back office. “It depends on the retailers how they want to use the electronic shelf labels and how they want to customise them. Obviously, today’s physical stores have to deal with strike opposition from the internet. “Retailers can give brands the chance to interact with consumers in-store. It is a smart interaction because the retailer can identify the consumer. It is a wealth of new services that you already have on the internet and now retailers can provide it in-store. “It is a real novelty and so much more. We believe QR codes were the first step to extend information but it’s not so practical. It’s not so smart. This is only the beginning”. SES’s NFC shelf edge labels make use of NXP’s nTag chips and the tags are produced by Identive. “NFC is the perfect technology for retailers, providing security but also the intuitive and convenient ‘tapping’ experience that consumers like,” says Rutger Vrijen, VP and general manager of NXP’s RFID tagging business line.